Because home building is such a big driver of economic growth, there’s a lot of interest in the relationship between student loan debt and homeownership. Homeownership rates among millennials plummeted during the great recession, and have yet to fully recover. 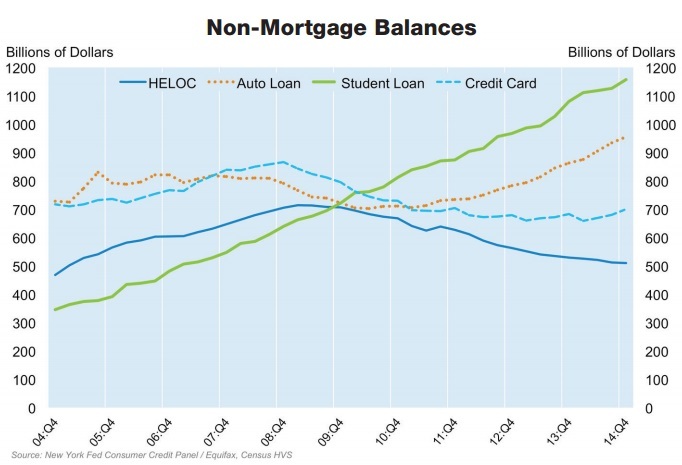 Student loan debt also soared, surpassing auto loans, credit card debt and home equity lines of credit (HELOC). Analysts at Goldman Sachs have concluded that college graduates with upward of $25,000 in student loan debt are less likely to own a home than those who borrowed less. But recent analyses by economists at Freddie Mac and Zillow suggest there’s more to the story. 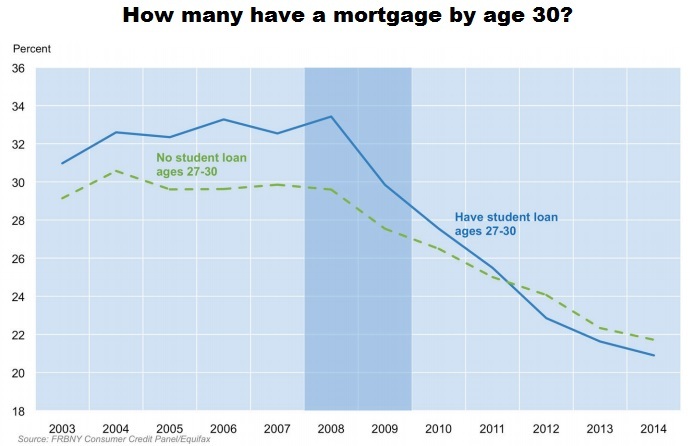 As the above chart from a recent Freddie Mac analysis shows, the percentage of 27- to 30-year-olds with mortgages has fallen dramatically, regardless of whether or not they have student loan debt. Before the recession, 27- to 30-year-olds with student loan debt were actually more likely to have a mortgage. Freddie Mac’s Chief Economist, Sean Becketti, talks about the relationship between student loan debt and homeownership. Zillow’s analysis suggests that the most important question to consider may be whether someone who’s encumbered with student loan debt has a degree — and whether it’s an associate’s, bachelor’s, master’s or doctorate. 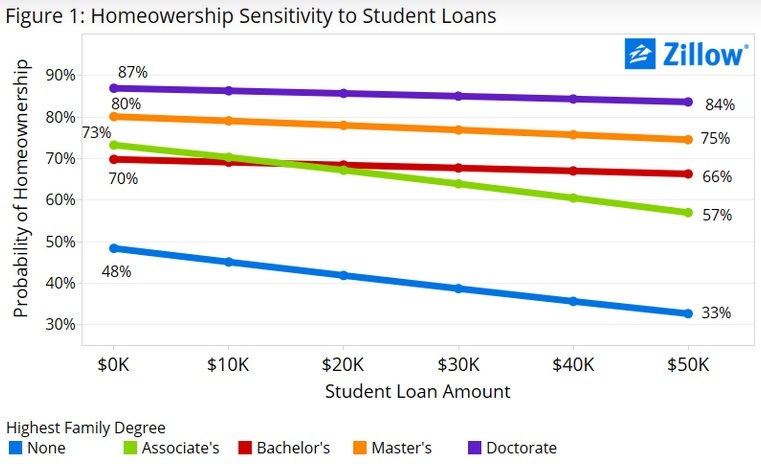 When economists at Zillow crunched the numbers, they found that while there was an adverse relationship between student debt and the probability of homeownership, the effect was pretty weak for those with a bachelor’s degree or higher. A couple in their early 30s with no student loan debt and at least one bachelor’s degree between them had a 70 percent chance of owning a home, compared to a 68 percent chance for a couple with $30,000 in student debt. None of which diminishes the fact that in the short run, student loan debt can defer hopes and dreams. A recent Gallup survey of more than 30,000 students who earned their degrees between 2006 and 2015 found 43 percent of those with more than $25,000 in loan debt have put off plans to buy a home, and 25 percent have delayed having kids. Student loan debt can make it harder to qualify for a home because it’s harder to save up for a down payment, and those monthly student loan payments can also increase your debt-to-income ratio (DTI), a critical metric for mortgage lenders. 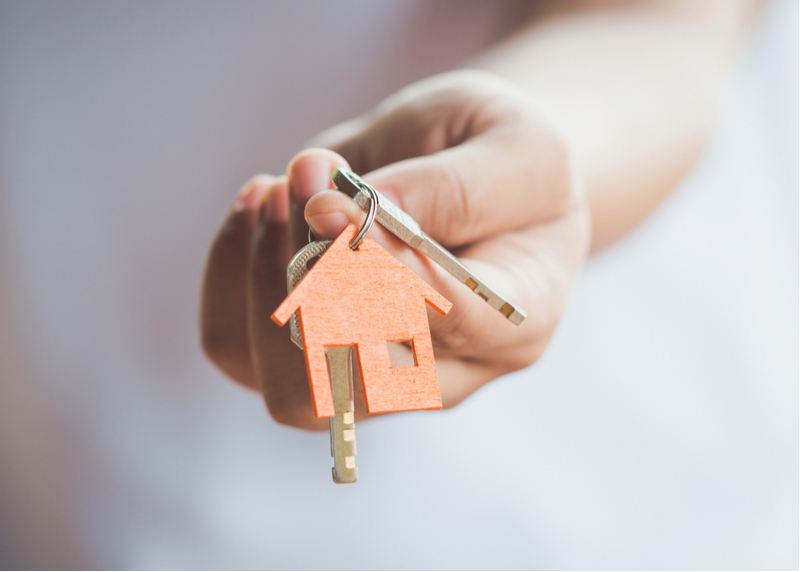 A number of state housing finance agencies offer programs that provide assistance to first-time homebuyers, some of which are targeted at recent grads and student loan borrowers. Refinancing student loan debt at a lower interest rate with a private lender can lower your DTI and help you qualify for a bigger mortgage. Borrowers who have refinanced their student loan debt with lenders on the Credible platform into a loan with a longer repayment reduced their monthly payments by $218, on average. A borrower who is able to qualify for a $300,000 home loan could boost their mortgage borrowing limit to about $350,000 by cutting their student loan payment by $218 a month. Extending your loan term can increase your total repayment costs, and refinancing federal student loans with a private lender means giving up some benefits like access to income-driven repayment programs and the potential to qualify for loan forgiveness after 10, 20 or 25 years of payments, so do your research.